Crude Oil Daily: Will Pumpuni refinery be like TOR? As government continues to dance around the challenges facing the state-owned Tema Oil Refinery (TOR), some natives of Pumpuni in the Western Region are beginning to express fear and anxiety over the Pumpuni oil refinery project which government has already acquired land to establish. Valued at $235million, the project, which includes a network of storage facilities, tanks and pipelines as well as export and re-export facilities is to be funded largely under the $3billion China Development Bank (CDB) loan, the Master Facility Agreement (MFA) of which parliament approved early in 2012, after it was first presented to the house in August 2011. 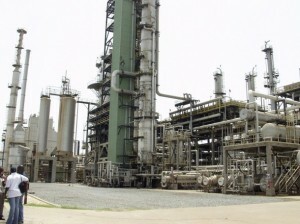 Speaking for the Pumpuni community, Mr Isaac Andoh, who has developed interest in activities of the oil and gas industry in the country, told The Finder that he is concerned how another refinery could be established by the state when the existing one has not been well managed, with several suggestions that it should be sold to the private sector. “In fact I am wondering how another refinery could be established considering the numerous problems that TOR is facing. What is the guarantee that the Pumpuni project will even see the light of day?” he asked. Mr Solomon Kwofie, an active community leader in the Ahanta area of the region, said he would be surprised if government abandons the project because communities along the coast of Ahanta have been assured by government that the establishment of the refinery at Pumpuni and other parts of the coast will open up the downstream sector of the oil and gas industry to create jobs for many of the unemployed youth in the region. “Any attempt to abandon the project will affect job creation in this area. Some of us will, therefore, do everything possible to push government to undertake the project for the benefit of our people,” he stressed. A farmer, Mr Jeremiah Atine, also told the paper that farmers have been assured that the establishment of the refinery at Pumpuni will improve their activities. “We are, therefore, worried that nothing is being done about the project after assurances that the refinery will create jobs, bring money into the pockets of local people, and also impact positively on farmers’ income,” he added. But will government go ahead with the Pumpuni refinery project after TOR was described variously as a high-risk entity that no bank would want to be associated with? In May 2010 it was disclosed that the $1.5 billion, 100,000-barrel-per-day refinery in Pumpuni, Ghana, was been delayed because of the lack of a contractual agreement with the government. The refinery was originally scheduled to begin construction in early 2011. In 2012, it was reported that processes towards constructing a gas storage terminal for processed gas, including liquefied petroleum gas (LPG) by the Bulk Oil Storage and Transportation Company Limited (BOST) had begun earnestly, as the company awaited its natural gas transmission utility (NGTU) licensing by the Energy Commission. The project includes integrating all of BOST's depots and involves a petroleum terminal at Pumpuni, 25-kilometres west of Takoradi in the Western Region, where processed gas from the Jubilee Oil Field would be stored.